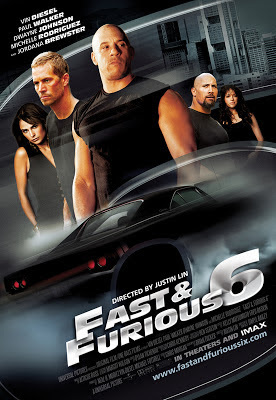 Agent Luke Hobbs enlists Dominic Toretto and his team to bring down former Special Ops soldier Owen Shaw, leader of a unit specializing in vehicular warfare. That being said, the crew teams up to foil a highly trained drivers and military operative's plan to create a devastating device plus resolving a ghost from the past. I am pretty sure I didn't get the memo that Fast & Furious 6 was re-written into a cop movie. It's the 6th in the franchise and probably the most far-fetched film of the money milking series, the whole plot seemed to be a far off fantasy right out of the screen writers mind. Furious 6 was a joy ride for action junkies but it's exaggerations of the action scenes were far too unrealistic for my enjoyment and the convenient storyline just somehow makes it too unrelatable. There was a tank, there was a plane a few people die on the way and if you take it far enough you might get a tv series coming out really soon. It was entertaining but not impressive and I personally find it dull. 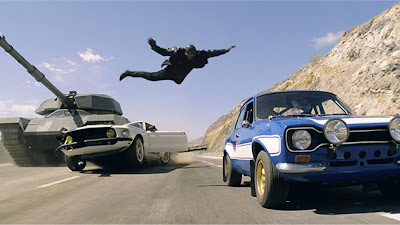 What happened to the car races, the adrenaline pumping tight corners and the impressive camera work that first made the franchise famous? "I missed the adrenaline rush and the unique car showcases"